Radio Ranch is a popular Western tourist attraction for visiting Easterners, mainly because of its co-owner Gene Autry’s musical broadcasts; the ranch’s existence becomes threatened when a group of unscrupulous scientists led by Professor Beetson (J. Frank Glendon) discover that beneath Radio Ranch lies the subterranean realm of Murania, a hidden, scientifically advanced world rich in radium. 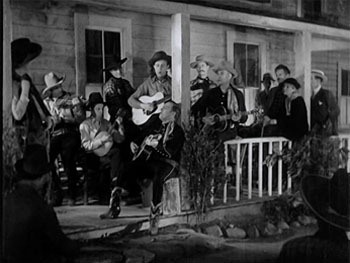 Beetson and his associates hope to seize control of Murania’s resources–while the Muranian Queen Tika (Dorothy Christie) is determined to prevent an invasion by “surface people;” both Beetson’s gang and the Muranians decide that eliminating Gene Autry–and thus vacating Radio Ranch–is the first step towards achieving their divergent goals. It doesn’t take long for Beetson’s gang to frame Autry for the murder of his ranching partner Tom Baxter, and for Queen Tika to order her border guards (the “Thunder Riders”) to capture Autry at all costs; Gene must dodge the sheriff, Beetson’s thugs, and the Muranian soldiery while simultaneously trying to clear himself and save his ranch by living up to his broadcasting contract. The schemes of Lord Argo (Wheeler Oakman), a Muranian nobleman who’s plotting to overthrow Queen Tika, wind up posing yet another threat to Autry, but the beleaguered rancher manages to overcome all dangers both above-ground and below, with the invaluable aid of Baxter’s resourceful children Frankie and Betsy (Frankie Darro and Betsy King Ross). Most reviews of The Phantom Empire emphasize its bizarreness, but plot-wise the serial really isn’t especially weird by genre standards; many other chapterplays featured futuristic civilizations every bit as colorfully odd as Murania. The chief difference between Empire and other science-fiction serials is the Western backdrop and the singing-cowboy aspect of the plot; the juxtaposition of horseback chases and country songs with ray-guns and robots makes the science-fiction gimmickry seem somehow more off-the-wall than it would have in urban, jungle, or outer-space settings. 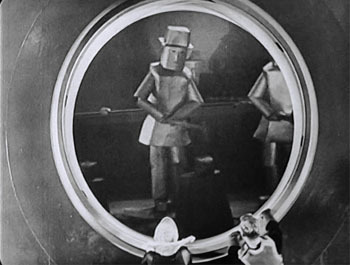 This unique Western/sci-fi combination, however, has made Empire probably the most popular and certainly the most famous of Mascot’s serials. Above: Life on Radio Ranch (left) and life in Murania (right). The contrast can’t help but seem bizarre. Empire’s screenwriters John Rathmell and Armand Schaefer (Wallace MacDonald, Gerald Geraghty, and Hy Freedman are also credited with “story”) follow tried-and-true Mascot story formula by forcing their hero to go on the run early in the proceedings and by continuing to stack the deck heavily against him as the serial proceeds–thus ensuring that the audience stays involved in his adventures. They make their storyline smoother than the average Mascot narrative, avoiding any attempts at mystery-making and thus steering clear of Mascot’s characteristic plotting illogicalities. They also reduce (but don’t eliminate)) Mascot’s equally typical plotting repetitiveness; by delaying Autry’s actual entrance into Murania until Chapter Five, and by gradually placing greater emphasis on the Muranian revolution subplot–before finally allowing it to take center stage in Chapter Ten–they partially succeed in masking the fact that much of the serial’s action consists simply of Autry being continually chased around by the authorities, Beetson’s thugs, and the two factions of Muranians, while trying to find a way to make his daily radio broadcasts on schedule. The broadcast subplot, incidentally, at times seems more odd than the main Muranian plot: we’re repeatedly reminded that Gene will immediately and irrevocably lose his radio contract if he misses even one broadcast–but there’s never any suggestion that the network or his sponsors might simply cancel his show after he becomes a fugitive murder suspect; apparently his backers are believers in the old “any publicity is good publicity” motto. 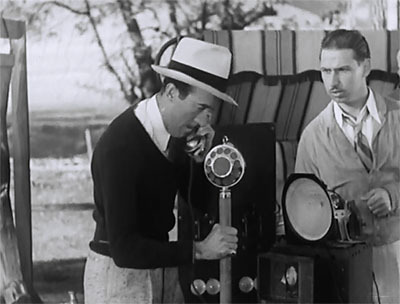 Additionally, some of the “radio” broadcasts that Gene hosts are truly strange–full enactments of gun battles and holdups that look more as if they’re being performed for a television audience; one gets the impression that the writers either had no idea how a radio show was produced, or else assumed that the audience didn’t. Above: Gene’s radio crew are happy to learn that their fugitive star is about to make an impromptu broadcast–while simultaneously fleeing Muranians in an airplane and holding one of Beetson’s men at gunpoint. That’s show biz. Unexpectedly, Rathmell, Schaefer, and the other writers actually manage to make the “phantom empire” of Murania seem culturally alien to some degree, not just a copy of our own world embellished by odd costumes and gadgets; it comes off as both an admirable and repellent civilization, a utopia whose citizens have become partly dehumanized in their pursuit of a perfect society. The Queen Tika character–who smugly praises the serenity and scientific genius of her people, frequently and scornfully comments on the greed, hardship, and violence prevalent in the “surface world,” and shows herself to be completely ruthless in her attempts to protect her realm from surface-world contamination–is the script’s chief vehicle for creating this impression of Murania, but several smaller touches neatly reinforce said impression, including the calm willingness with which a Muranian officer accepts a death sentence as punishment for his “failure” to protect the empire, and the Muranians’ disgusted remarks when they see an apparent fellow-citizen (really a disguised Autry) carrying a heavy bundle–instead of having a robot handle the burden for him, in the normal Muranian way. 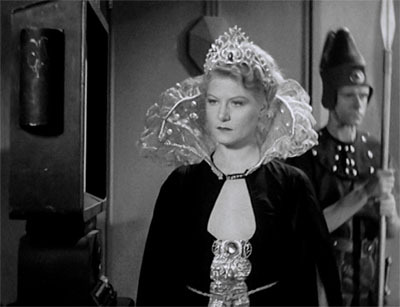 Above: Queen Tika shows Autry her labor-free world and his poverty-riddled one via her television device. 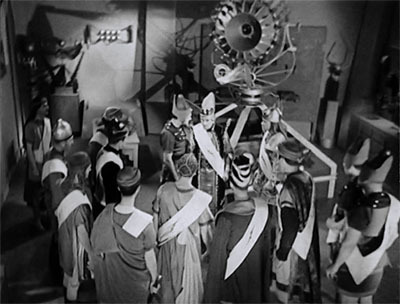 The writers fail to fully develop Lord Argo’s conspiracy against Queen Tika, however; Argo’s keen interest in discovering how Autry can breathe in the “thin” air of the surface world, and his scientific accomplice Rab’s development of an “atom-smashing” ray machine capable of “destroying the universe” would seem to suggest that he’s hoping to conquer the surface world, and has decided to overthrow the isolationist Tika as a first step in this plan. Unfortunately, these hints are never taken further, and we’re eventually left to conclude that Argo merely wants to seize Tika’s throne and has no other agenda; giving the would-be usurper ambitious designs on the entire Earth would have given greater urgency to Autry’s fight to stop Argo’s revolution in the concluding chapters. The later Republic chapterplay Undersea Kingdom (which Rathmell also scripted) did a better job of presenting its heavy as a threat to our world–although that serial’s script also did a much poorer job of giving character to its hidden civilization than Empire does. Above: Lord Argo’s rebels (gathered round the atom-smashing machine) prepare to strike. The mattes and miniatures used to depict Murania are quite effective, early examples of Howard Lydecker’s special-effects expertise; the frequently-seen underground elevator and the weapons room are particularly impressive. 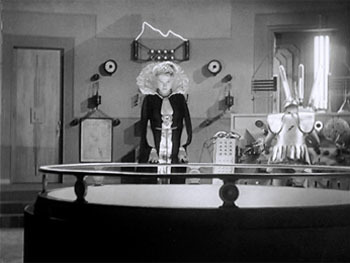 Life-size props–like the sparking equipment in Queen Tika’s television room, the robots, and Rab’s giant atom-smasher–also look good; skilled cinematography by Ernest Miller and William Nobles enhance both real and artificial Muranian sets with plenty of strong and well-composed shots. However, the emulsion-melting effect (later seen in SOS Coast Guard) used to depict the destruction of the city at the end are only partly successful–believable when buildings are being destroyed, but unconvincing when people are shown dissolving. 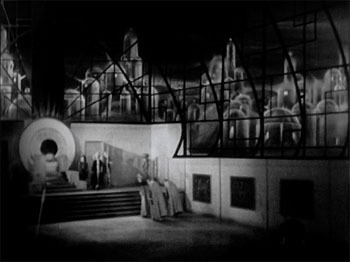 The stairs and outer façade of the Griffith Observatory are put to good use as Muranian streets in several scenes, while the surface entrance to Murania is represented by Bronson Canyon and Bronson Cave. 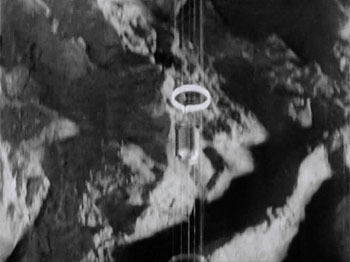 Above, top left: The elevator descends to Murania. Top right: Queen Tika’s throne room. 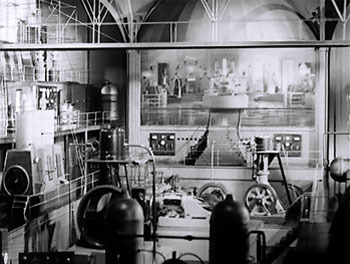 Bottom left: The Queen’s laboratory and television room. Bottom right: A master shot of Murania. 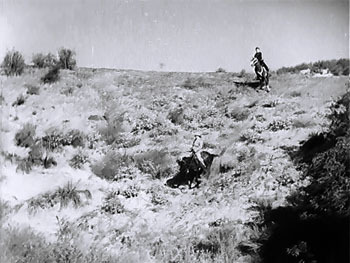 Iverson’s Ranch provides the setting for most of the serial’s above-ground sequences–and, as in other Mascots, is photographed to strikingly picturesque effect throughout; Miller and Nobles’ skill is just as much in evidence here as in the Muranian scenes. 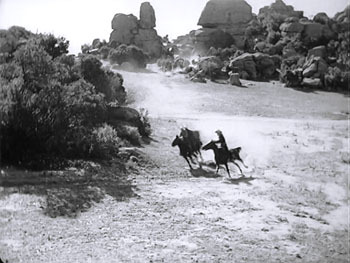 The Ranch is the setting for several excellent chase sequences–including the Thunder Riders’ pursuit of the good guys in Chapter One, the airplane/horseback chase in Chapter Two, the car/horse chase in Chapter Three, the horseback chase in Chapter Eight, and Gene’s final gallop after Beetson in Chapter Twelve; Mascot mainstay Yakima Canutt is absent from the stunt team this time out, but his frequent collaborator Ken Cooper does a good job as Autry’s equestrian double in these and other scenes, under the sure guidance of action expert B. Reeves Eason (who co-directs with Otto Brower); Tracy Layne and George Magrill are also on hand for stunt duties. Above left: Betsy, Frankie, and Gene flee the Thunder Riders. Above right: Gene pursues Beetson. Oddly–considering Eason’s talent for directing large-scale action, as seen in Undersea Kingdom and The Desert Hawk–the serial’s weakest action sequence is the battle between Argo’s rebels and Queen Tika’s soldiers in Chapter Ten; it’s competently staged, but is too brief and hurried to make the impression it should. The serial’s other action scenes are quite strong, however; highlights include the Chapter Five fight in the shack (with Gene fending off a flamethrower-wielding Muranian), the Chapter Eight elevator fight, the Chapter Eleven fight in the raygun room, and the fights in the elevator and in the weapons room in Chapter Six (both of these scenes are part of an excellent and lengthy setpiece that has Autry racing around Murania as he tries to prevent a missile from being launched against his friends). Above left: Autry fights an armed and dangerous Muranian in Chapter Five. 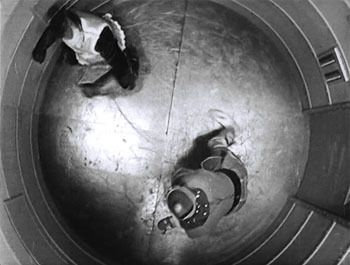 Above right: A striking overhead shot from the Chapter Six elevator fight. 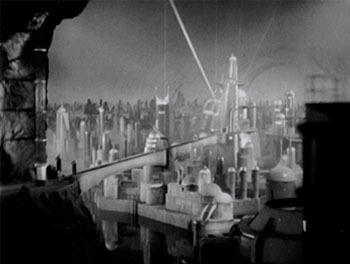 The genre-mixing of Empire allows for a nice variety of chapter endings–the standard but very well-done cliff fall, car crash, and plane crash that conclude Chapters One, Three, and Eight, and the more unusual missile, robot-torch, and raygun cliffhangers of Chapters Six, Ten, and Eleven. 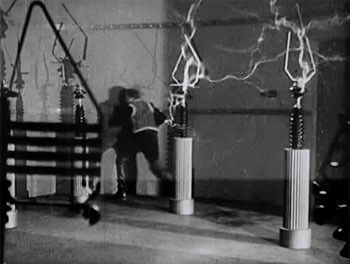 Autry’s zapping in the electrical “death chamber” at the end of Chapter Five is effective too, as is the double cliffhanger of Chapter Two (which has Gene shot off his horse while Betsy King Ross and Frankie Darro are seemingly blown up by a Muranian missile). Autry’s fall from a catwalk in the Muranians’ powerhouse in Chapter Seven is also good, although resolved by mild cheating; the resolution to the Chapter One cliff fall involves a bit of cheating too. On the other hand, the resolution to the Chapter Six missile-strike cliffhanger is not only fair but extremely memorable, with Gene hovering on the brink of death–and, eerily, actually passing into the Great Beyond for a few seconds–before being revived by Muranian technology. 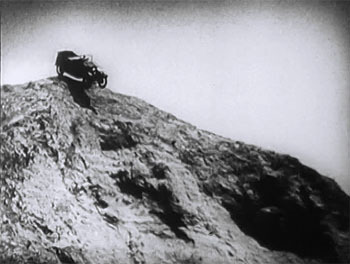 Above left: A car with Gene at the wheel plummets from a particularly intimidating-looking cliff to conclude Chapter Three. 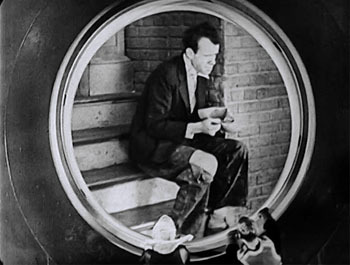 Above right: Gene tries (seemingly in vain) to escape lethal electrical arcs in the death chamber at the end of Chapter Five. 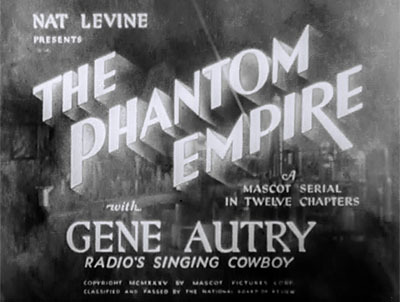 One waggish reviewer has quipped that the above-mentioned revival scene might explain why Gene Autry’s Empire performance is rather zombie-like, but this evaluation is not accurate; Autry, who had been a popular radio singer before Mascot producer Nat Levine brought him to Hollywood, acquits himself quite respectably in his first major screen turn–for a non-actor, that is. He shows plenty of cheerful energy and enthusiasm when hosting Radio Ranch broadcasts, or when rattling off quick orders to his sidekicks; he also does well when it comes to silently registering determination or surprise. Only when called on to deliver extended dramatic or expository dialogue does he appear painfully amateurish; during his confrontation with Queen Tika in Chapter Five–during which he criticizes the “dead air” of Murania and praises the virtues of the open range–he casually but awkwardly stumbles through lines that really need to be delivered with more theatrical expertise; he also noticeably flounders when explaining his plan to trap the villains in the last chapter. Expectedly, he’s much more comfortable when he’s handling his various songs–country tunes like “Silver-Haired Daddy of Mine” and novelty pieces like “Uncle Noah’s Ark.” These musical interludes never last long enough to slow the serial’s brisk pace, but do add a highly enjoyable extra dose of entertainment to the proceedings. Above: Gene Autry at the mike for a Radio Ranch broadcast. 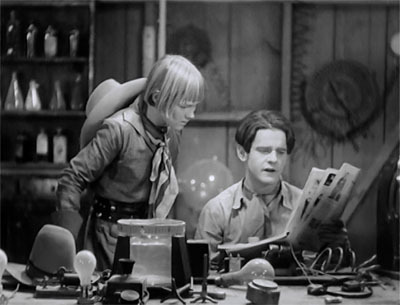 Frankie Darro, in his final Mascot serial, is easily the best actor on the good guys’ team; his assured performance as Frankie Baxter helps to carry many scenes that Autry probably couldn’t have pulled off alone. Darro, though approaching twenty by this time, is still able to convincingly portray a character who’s obviously supposed to be in his early teens; he gives young Baxter a well-balanced and appealing combination of boyish enthusiasm and shrewd resourcefulness. His reaction to his father’s death in Chapter One, in which he grimly tries to choke back tears, is also excellent–just as powerful as the more openly emotional crying bits Darro performed in his earlier Mascots. Child trick-rider Betsy King Ross, who previously co-starred in Mascot’s Fighting With Kit Carson, lacks her screen sibling Darro’s acting experience and frequently sounds as if she’s memorized her lines by rote, delivering them in spirited but careless fashion. However–as in Carson–her performance is so unaffected and energetic that it becomes endearing rather than jarring. She also seems to have a good rapport with Darro; their characters’ bouts of friendly brother-sister bickering come off as completely natural and believable. Above: Frankie Darro ponders as Betsy King Ross watches. Autry’s friend and future B-western sidekick Smiley Burnette teams with future radio comic Peter Potter (billed here as William Moore) to provide the serial with comedy relief; their folksy and fumbling antics (accidentally setting off tear-gas bombs, pressing the wrong buttons in the Muranians’ laboratory, etc.) are rarely very funny, but are never obnoxiously unfunny; however, their collaboration with Autry on “I’m Oscar–I’m Pete” song is actually enjoyable. They’re also allowed to be genuinely helpful at times (particularly when they disguise as robots and coolly and amusingly bonk some Muranian guards over the head), which helps to make it easier to forgive their inopportune clowning at other times. The running gag surrounding Smiley’s inexhaustible supply of harmonicas is probably the best of their non-musical comedy bits, a piece of cartoonish drollery that seems to have been inspired by the Mickey Mouse/Donald Duck short The Band Concert. 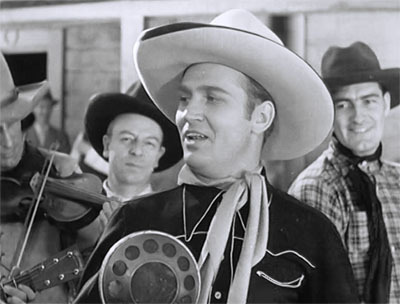 Above: Smiley Burnette (right) tells Peter Potter that he’s forgotten the harmonica tune he uses to make his horse move. As Queen Tika–whose absolute devotion to her subjects and murderous treatment of outsiders gives her both a heroic and a villainous aspect–Dorothy Christie is handed potentially the most memorable role in the serial. However, while she certainly does a good job of conveying regal hauteur, she’s so relentlessly hammy–delivering practically all her lines in loud and ringing tones–that she fails to make the character as interesting as she could have, had she taken a more subtle approach to the part; she simply rants too much to come off as particularly complex. Her air of repressed amusement when questioning outspoken young surface “sprouts” Frankie and Betsy is a good touch, though, and one wishes she’d managed a few additional displays of emotions other than haughty rage. Her final scene is actually quite moving, but this is more a result of dramatic direction and cinematography than any great acting on Christie’s part. Above: Dorothy Christie looking typically imperious. Scene-stealing veteran heavy Wheeler Oakman is a delight to watch as the conniving Lord Argo–deferring to the Queen with hypocritical oiliness, furtively seeking ways to divert her suspicions, craftily plotting with his fellow-conspirators, and smugly gloating when he temporarily succeeds in seizing the throne. The intense and intimidating Warner Richmond, as the rebel scientist Rab, doesn’t have as much screen time as Oakman does, but easily matches–even upstages–his co-villain whenever he’s onstage; Richmond’s air of grim self-assurance and controlled ferocity makes his character seem like the true power behind Lord Argo–an impression reinforced when Oakman’s Argo, in a panicky moment, defers to the advice of Richmond’s implacable Rab. 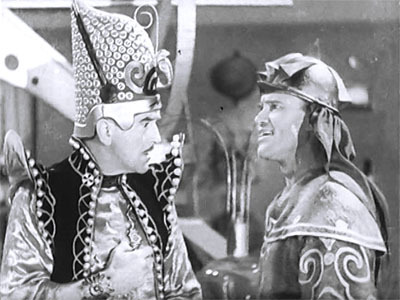 Above: Wheeler Oakman (left) and Warner Richmond. J. Frank Glendon, the urbane and two-faced brains heavy of The Lost Special, does a similar turn here as the sleekly respectable but coolly villainous Professor Beetson; he’s quite good when concocting plots or pretending to be friendly to the good guys, but spends much of his time on the periphery of the serial’s action (rather disappointingly, he never gets a chance to interact with the Muranian characters). Hoarse-voiced Jack Carlyle, as Beetson’s impatient chief cohort, provides a good contrast to the slick Glendon but has even less to do; Edward Peil is another of Glendon’s associates. Stanley Blystone operates the gadgets in the Muranian control room throughout the serial, while Frank Ellis has a few scenes as a Muranian soldier; Charles French brings plenty of venerable dignity to the role of Queen Tika’s trusty advisor Mal. 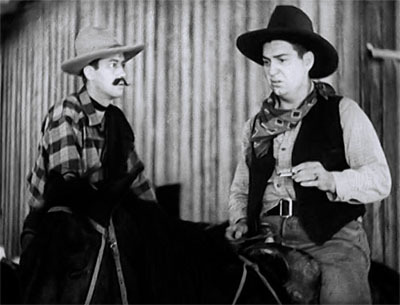 Duke Lee is likably genial in his short turn as the ill-fated Tom Baxter, Hal Taliaferro has a bit as a Thunder Rider, and child actor Bobby Nelson appears as one of the “Junior Thunder Riders”–the group of helpful ranch kids who don improvised capes and helmets to assist Frankie, Betsy, and Gene in their struggle with the real Thunder Riders. The Phantom Empire is a little too small in its plotting scope and a little too unevenly acted to ever attain the epic aura of the later Flash Gordon chapterplays (to which it’s frequently compared), but it’s a highly enjoyable serial adventure nonetheless, and well deserves its general popularity among cliffhanger buffs. Chock-full as it is of colorful sci-fi gadgetry, striking Western scenery, appealing songs, and fast action, it’s easy for a viewer to find much to enjoy in every one of its episodes. 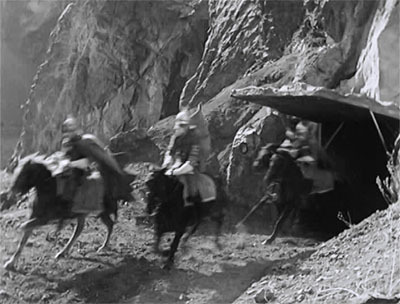 Above: The Thunder Riders ride out of Bronson Cave. This entry was tagged B. Reeves Eason, Frankie Darro, Hal Taliaferro, Mascot serials, Smiley Burnette. Bookmark the permalink. Does any body know the actors who played Professor Beetson’s dog heavies? I think they actually had more screen time than Jack Carlyle and Edward Piel. They wound up getting shot in the back by Beetson in Chapter 12. I’d like to have been able to identify those henchmen, Howard, but drew a blank. The eccentric crediting practices of so many serials (Mascot, Republic, Columbia–all of them frequently leave people with sizable parts out of the billing entirely; Universal seems to be a little better at providing complete cast-lists) is something that continues to frustrate me. Glad to see you back on the boards Sorry to say that I don’t share the feelings many other have for this serial.To me its outdated. Ill let it go at that. Two stars. To me, THE PHANTOM EMPIRE is miles ahead of any other Mascot serial, and is by far the winner in the fun factor. Nat Levine thankfully spent some money on costumes and props, and there were no economy chapters, or weak cliffhangers, like many other Mascot serials. 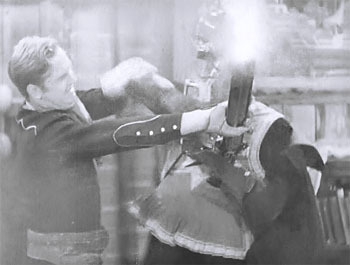 Only weak part is Gene Autry just hadn’t learned to act yet. I saw it as a teenager and at the end where Autry says it is the last show of the season, and the serial comes to an end, I was really saddened, I just didn’t want it to end, this was probably the only serial I felt this way about. I think the weird factor for The Phantom Empire is less the lost underground civilization than Gene Autry and his singing cowboy schtick. The whole getting back to the microphone for a song every day, faking a stagecoach robbery with real rifles over the radio(? ), plus the junior Thunder Riders kiddie bit . Autry adds a lot to the off the wall charm–short, noticeably overweight, ordinary looking, garishly dressed, seemingly a bit uncomfortable on a horse–what a cowboy hero! I doubt the serial would be as winning with a Buck Jones or John Mack Brown in the lead. An odd thing for me was the queen watching film of the upper world corruption and seeing a horse race and a boxing match? One would think there was worse going on in the 1930’s to focus on. This one is truly one of a kind–except for Frankie Darro, generally mediocre to poor acting, Smiley as comedy relief, really old-fashioned music, but some impressive Lydecker creations and a fast moving plot. I thought the revolt and the motives of the insurgents could have been better defined. The queen was so harsh and cruel that for a while I thought the revolutionaries might be the good guys, except Argo was such an obvious thirties villain type. With all the flaws, entertaining, so I’ll rate it ***1/2 out of *****–a campy must see. Good point about the bizarreness of the alleged “radio” broadcasts; you’ve reminded me that I forgot to mention that alongside the bizarre radio contract, and I’ve amended the review accordingly. Also, a good point about the revolutionists initially seeming sympathetic–particularly true, I think, when Argo initially saves the rather admirable captain from execution (though, of course, Argo’s own threat to kill the captain if he doesn’t join the rebellion quickly diminishes this sympathy). This is another reason why I think that Argo should have been designated as a would-be conqueror of the surface world: doing so would have helped to make it much more clear that he was far worse a ruler than Tika. I’ve always thought that this film had all the charm and sense of urgent wonder of the best of the Mascot serials. The sets and props are impressive, and the performances of Frankie Darro, Dorothy Christie, and Wheeler Oakman more than offset the inadequacies of Gene Autry, whose great success has always mystified me. one of the most imaginative serials ever made. Has anyone ever read or heard an interview by one of the kids who played a Junior Thunder Rider? Only Bobby Nelson (1922 – 1974) is credited in IMDB data. This serial is over 80 years old, but one of those youth could still be living.